This is the story behind my Guinness World Record™ for the Fastest time to shell one boiled egg. I was due to attempt several world records at a local record-breaking event. As always happens, I was excited to the point of irritating every person around me with my hyperactivity. Ironically, it annoyed me when others said there was nothing to get so excited about when it comes to world records. Oh yes there was! Such statements were highly offensive to me, since world records are what society ought to base itself on, I think. Hopefully you agree. I was keen to maximise my opportunity by making a number of world record attempts at the public event. I knew of others who were planning to attempt only a single world record. But to me, one world record attempt was nowhere near what I'd be satisfied with. Perhaps 20? Yes, that idea appealed. Even if I couldn't attain 20 at once, there was no way I'd settle for one. My over-active mind thought and thought. Eventually, after what felt like a mental marathon, I settled on one idea of hundreds for this particular attempt. Something to do with an egg seemed to carry sufficient appeal for me, so I began investigating possibilities. During my research, I discovered that there was a lot I could possibly do: throwing, head-butting, spinning, balancing, blowing, cooking or more. These were handy items from nature – eggs - I thought, as I dreamed of future possibilities. After quite some thought, I chose to make my world record attempt something new. Or, depending on which way you view things, something that's been done since time immemorial. I hoped I'd be the first to shell an egg for a world record. At a friend's house, I picked the first egg I saw in the fridge. I gave the choice no consideration at all; I simply wanted to test the procedure to get an idea of the process under world record attempt conditions. Having hard boiled the unlucky egg, I kissed it softly and then timed myself in shelling it alongside the kitchen sink. My friend had a convenient timer which made my multitasking easier. So I was reasonably confident that I'd got an accurate reading. Being the very first occasion on which I'd timed myself to shell an egg in my life, I figured I'd done pretty well: I had finished in just 4 seconds. There was no eggshell left stuck to the egg, and the white was smooth and unbroken. I'd done myself proud. As a mini celebration, I twisted one arm behind my back until shots of sharp pain stung my joints, all the while pushing my hand right up to my shoulder so I could literally pat myself on the back. It felt lovely to be acknowledged as a hero in my own right. Conversely, it was a pity I wasn't being witnessed to make the effort official as a world record attempt. Then, from that point forward, no matter how I tried, I could not repeat the achievement – so I didn't deserve another pat on the back. I just couldn't get it right again, and it wasn't for a lack of trying. Being somewhat of a lunatic, I continued trying long after most normal people would have given up. I bought, hand-selected and inspected each egg from then on, but even so, I was unable to beat myself. I wondered if perhaps I'd coincidentally found the one and only perfect egg for the job that day I'd looked in my friend's fridge. At a friendly restaurant, kitchen staff boiled a dozen eggs for me. I was hopeful that the touch of professional chefs' hands would make my egg-shelling results favourable. Practising with them, I did fairly well but I still couldn't beat my own best. Later on, by myself, I inspected the membrane under many eggshells – both boiled and raw, in a strange self-inflicted research project. Doing so made me feel like a renowned scientist on the brink of the latest great breakthrough for the benefit of all on planet earth. With initiatives like this, I spent much time trying to figure out the fastest and most effective shelling technique. How, I was puzzled, could I succeed once but not again? The night before the event, in a large local shop, my eyes landed on the last box of ideally sized eggs on a shelf as I paced toward it. But I couldn't get to the prize because trolleys and shoppers blocked my way. In my mind, I tossed them all over the shelving into the adjoining aisles so I could stride up to the goods I wanted. But in reality I politely inched past mothers and slid along the sides of two laden trolleys. When I'd got myself to within arm's length of the box, a grumpy man reached for it. I couldn't believe what I was seeing when that hairy unwelcome arm of his extended its fingers, preparing to wrap around my precious box of eggs! Although I threw my hand forward, I missed. While pulling noticeably strained faces to help me get my point across, I tried to explain without pleading that in the morning I needed to deliver results on a stunt I'd been practising for. The untidily dressed machine operator raised his voice, “What does it matter – just use any egg. You don't need this size egg. These ones are going home with me for dinner!” I was left standing in the aisle, still pulling unhappy faces, but with my jaw dropped in bewilderment. Dragging my feet, I picked the next best size eggs and headed home to practise. All night, the only thing I could think of what the difference would end up as in my results the next morning. I wished I could have located that man and confiscated every egg he'd buy for the rest of his life. But I had to face the situation. In silence, I shelled a half-dozen of the eggs I'd just bought, trying to improve on my technique each time. I reached out to the closest egg with as much speed as my arms could produce, transferring it onto the empty plate. I had no way of knowing if the eggs I was looking at would shell easily or not. All I could do was hope and give my best effort. The first egg ended up as a mess with pieces of jagged shell stuck fast to it. The attempt was abandoned. My next attempt ended in much the same way, with a split egg and chunks of egg white clinging to bits of shell lying to my left and right. At least 5 attempts went wrong – in front of nearly 100 spectators who'd been told I was about to shell an egg faster than any human alive. It seemed I had brought an entire batch of under-performers! Shameful, to say the least, even for a madman. After several attempts, I was not satisfied. In fact, I preferred to look down at my feet than at any person – least of all at the professional photographer who'd been commissioned to capture the day in images. Out of the corners of my eyes, I could see the tightening circle the crowd was making; they were anxious to see speed from me. I knew that, and I was trying. They just couldn't see the results. Gazing up at my helpers, I nodded in agreement to one more attempt. Pursing my lips, I braced myself and vowed to give it all I could. Kneeling on the stage's carpet, I wondered if I'd have produced a better time had I managed to get my hand on the last box of ideally sized eggs in the shop the previous night. 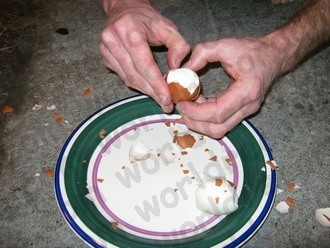 That thought refused to leave my mind as I stood, as the audience clapped, as I cleaned up more eggshell than I'd seen in a long time, as my assistants completed the required admin with me, and as I wandered off to my next world record attempt.